I have submitted a couple of images to Allied Arts for their Juried Art Show…we’ll see if the juror opts for any to be included in the show! I am working on shows for 2009. So far I have a solo show at La Chateau Winery. They are a new winery at airport complex in Walla Walla. They occupy the old home of Clay in Motion across the road from the airport terminal. It is wonderful bright space. Expect to see a few large pieces in the show! The show is open for the months of April and May. We will probably due the artist reception right around the time of spring release, the first part of May. I will participate in the Joseph Festival of Arts first weekend in June. It is a large show and exhibits some really good art, both 2 and 3D. There will be new work at Whitman Cellars soon. Changing out wintery/fall paintings for some with the greens of spring! I am a residence artist there and always have 5-6 pieces hanging. Thank you Sally, Larry, John, et al. I just picked up a small set of the pan pastels. I haven’t stuck my paws in them yet, but they look amazing. The set came with all these sponges and applicators. It’s almost like a cosmetic counter with lush colors of eyeshadow. Once I try some, I will let it be known how they seem. It was a productive weekend! Two paintings to post…One has been sitting waiting for some touch up for a few weeks. 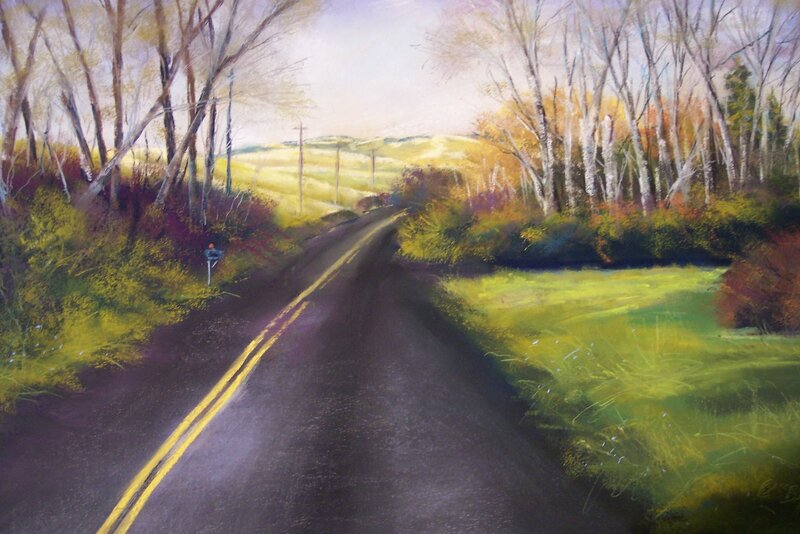 The painting I did this weekend is of a local road that heads up into the mountains…this is the beginnings of a beautiful drive. The other painting is “Heading to Summer Pasture”. I have wanted to paint this for a long time. 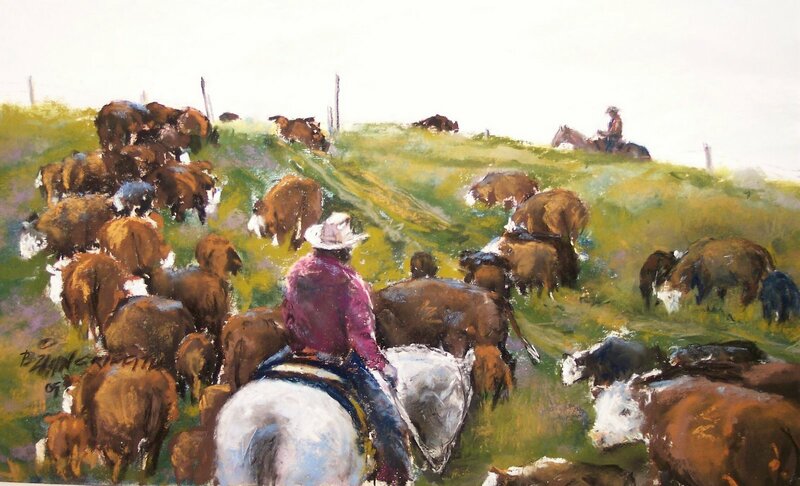 The painting is of my Mom riding “Jackpot” moving some of the cows and calves to a summer pasture. And anyone who knows cows…knows that when the grass is fresh and green and full of flavor in the spring, to get those animals moving is a chore….they want to graze and enjoy the feed along the way…Her neighbor is sitting on his horse along the horizon and along the fence to make sure all the “pairs” get through the gate into the new pasture. My Mom was a rancher and probably one of the best horsewomen I knew. She was a pro and I am happy to say that I am pleased with how this painting evolved. Only she deserved to see herself in art! OR check out the book “The NEW Creative Artist” by Nita Leland. It is a great source of inspiration and makes you thin outside your comfy little box. I have long been an admirer of hers and this book is a great asset to you library. It’s a cold and gray day in Walla Walla; not the promised sunny and 50. But with some good CD’s and a cozy work space, one can create and never feel the damp, bone chill of the outside. As a quick followup to the Hospice fund raiser onthe 7th…it was a big success and ever much as in previous years…a heartwarming note in the economic times of today. My piece was a the top selling piece of art for the event. It always does my heart good to have a grand sale at such an event for a stellar cause. 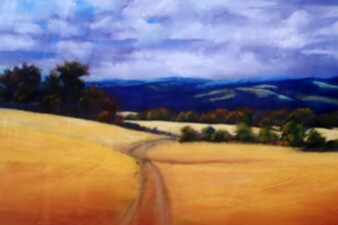 I have committed to a show at LaChateau Winery for the months of April and May, 2009. We are working on an artist’s reception date and are leaning toward the weekend of Spring Wine Release – first part of May. Images of painting are now online at Etsy.com for selling giclee prints and on greetingcarduniverse.com for selling greeting cards. You can access my store by my name. GCU is very interesting – card buyers can access this website, chose an image and create a card for less than $3. A nice 5×7 card. Check out the sites. Etsy is an artsy site where lots of stores/artists sell their wares. Soon the daily paintings will start again…they may be sketches some days; pastels another! There are always fund raisers that are asking for art for their auctions. One that I will nearly always give a piece of art to for auction is the Hospice fundraiser in Walla Walla. It happens in February and this year’s event is scheduled for tomorrow night at the Whitman. This organization does wonderful things for families and they deserve what we can give to the cause. Here’s hoping for a ever successful event! I will see you there! "Pocketful of Colors" by Robin Maria Pedrero: Blog Tour "I’d rather be in the studio"